5, 4, 3, 2, 1…BLASTOFF! 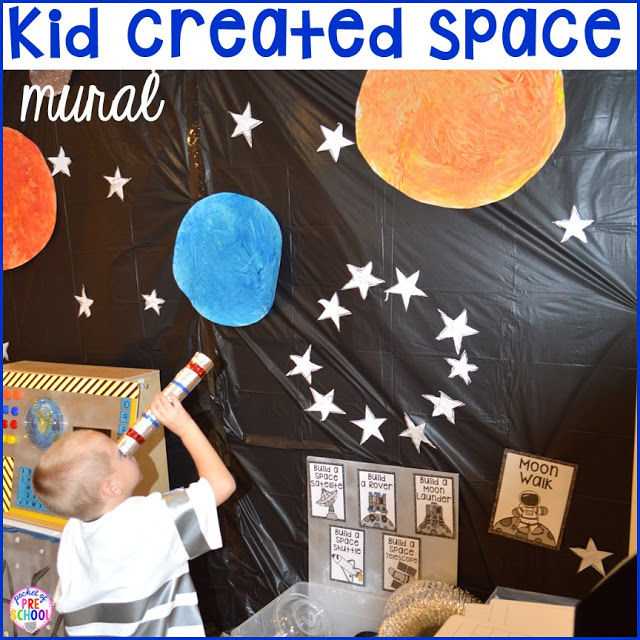 Create a Space Station in your dramatic play center! It’s an easy way to embed math, literacy, science and STEM into their play! Your students won’t even know they’re learning AND they will have a blast. Kids are fascinated by space! Here’s our SPACE STATION! It has got to be one of my favorite dramatic play themes to date! It looks so inviting that I want to go play there too. Our space station has two parts: The Space Shuttle and the Moon! For the Space Shuttle side, we used old car seats for the shuttle seats. I cut out all the seat belts. If you don’t have car seats, just ask your families for a donation. Perhaps there are a few somewhere that are expired. The end of the space shuttle is a cardboard tri fold presentation board (Dollar Tree) with colored tape at the bottom that we painted silver. One of the children painted the word NASA on the side! The photo above is the space shuttle shelf with all the astronaut supplies and the control board! I covered the shelf with foil to make it silver like a real space shuttle. I added some space signs, a keyboard, headphones, gloves, a launch checklist, space food (pom poms) and a jet pack. This is one of our control boards up close! We created a shuttle or mission control board using items from the hardware store and bottle lids. I also created a few printables for the board. I added letters and numbers to the board to sneak in some more literacy and math into their play! •Spray paint a thick foam poster board silver. I bought these foam boards from the Dollar Tree. •Put tape around the edges to protect them from getting bent during play. •Save and wash bottle lids. Hot glue the lids to the board. •Reflectors – Buy some reflectors from the hardware store and stick to the board. 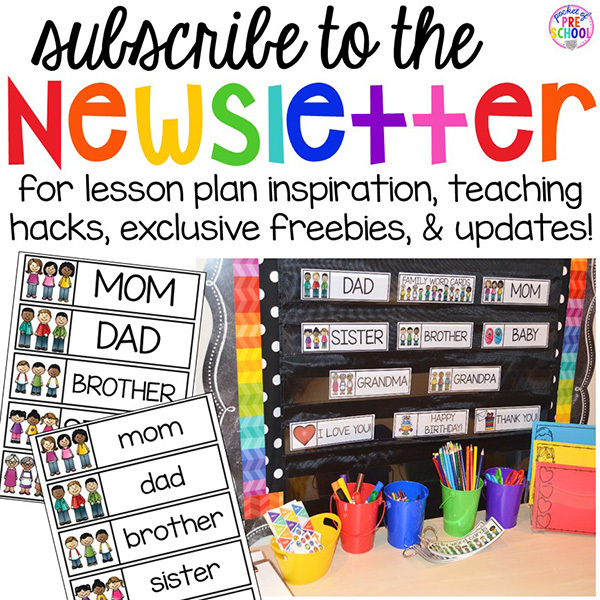 •Print, laminate, and hot glue the letters, numbers (backward like a countdown), space photos, letter board, buttons and gauges to the board. To sneak in some fine motor, I created Flight Plans! The astronauts trace the flight plans (aka various types of lines) with a dry erase marker. Look at these astronauts in action: flying the shuttle, eating space food, and reading the launch checklist! We even tried real space food at circle time one day. I made a Mission Number board to embed some math too! Students flip the number cards and call out what mission number it is during play! The other side of the Space Station is the MOON! I taped a yellow table cloth to the floor to divide the space. On the shelf, I added tons of science tools, printables and books for my little astronauts to use! When astronauts go to the moon, they used a moon lander and a rover. I thought it would be fun for students to build their own for their missions to the moon! I collected cans, dryer vents, foil food containers, silver lids and bottles for building materials! Students are using science, math and engineering skills as they build and create their moon landers and moon rovers! To take it to the next level, this little astronaut is creating a blueprint of the moon lander she built! This little astronaut is doing math by measuring and weighing the moon rocks. He is recording his findings on the Moon Rock Research page! Check out this Moon Rock Exploration box! I created it by spray painting a box silver, cutting a few holes and sticking in some gloves. Now they can explore like real astronauts! Make your own spacesuits! I found these white t-shirts at the Dollar Tree. Then I taped stripes on them with duck tape. It was super easy! Every astronaut needs a jet pack! Empty and clean out two milk or soda jugs, tape them together and hot glue some ribbon on for straps! I suggest making a few of these because they are VERY popular. Our space mural is always a popular part of space dramatic play! It’s just two black plastic tablecloths taped together. Students helped me make the planets and the stars. Grab my Space Station Dramatic Play pack and get all the printables, labels, signs, patterns, banners and more plus teacher direction pages (all filled with tons of real classroom photographs) to help you transform your center into a Space Station. I created everything for you. Just print, grab some props and set up the center! Trust me, it will save you a ton of time. Take the space theme all over the room! Grab my Space Math and Literacy Centers. It’s filled with space vocabulary cards, space writing paper, six space literacy centers, a space emergent readers and six space math centers. 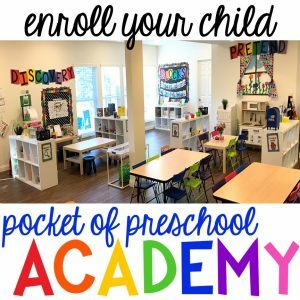 Just print, prep, and teach! Grab theme from my TPT store HERE. See them in action HERE. Need amazing space books for circle time? Check out this list of my favorite space books! Love it! Pin this image! 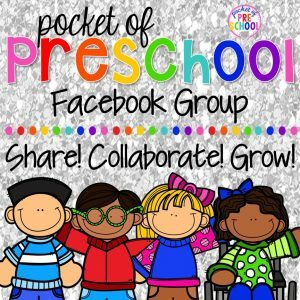 Previous Post: « First 10 Days of School – Lesson Plans and MORE!